Coming Up Short details the history of the NHL's Winnipeg Jets, one of pro hockey's least successful, but most beloved teams. The team's tumultuous 17-year journey is chronicled in exhaustive detail from their humble beginnings in 1979 to their tearful departure in 1996. This authoritative history of the Jets' NHL years is written by a fan, for fans, to remember and celebrate their team with equal parts fondness, anguish and humor. To purchase the paperback edition, please click here and for the electronic edition, please click here. 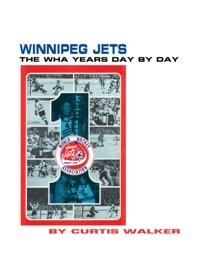 This book is an exhaustive and detailed day-by-day history of the WHA Jets, topped off with franchise statistics and rare promotional photographs. From the amazing Bobby Hull to multiple WHA championships, WHA Jets history is lovingly collected, told and celebrated for hockey fans the world over.